This topic contains 0 replies, has 1 voice, and was last updated by Eric Shade Avenged July 7, 2018 - 15:19. 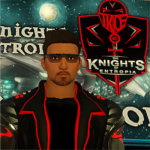 No member of The Knights of Entropia (TKoE) shall beg for free items, scam, spam or otherwise harass players of Entropia Universe. This type of behavior reflects poorly on you, as well as TKoE. All TKoE members must abide by our Society Attendance Policy, with the exception of Recruits who are not able to enter information into the Society Terminal. Offensive language must be kept to a minimum in TKoE Society Chat and Discord Channel. Excessive use of abusive or other inappropriate language will not be tolerated. A personal dispute between TKoE members must be discussed in Private Messages only (not society chat). This is to avoid disrupting the entertainment of others. You must be at least 16 years old to join TKoE. Pirating/PKing in lootable areas is not allowed. TKoE does not promote loaning items or ped to anyone, whether they are a member of TKoE or not. If a loan is given to someone, the loaner does so at their own risk. Do not assume that just because someone is a Knight, you can loan them your monetary items. To be a Knight requires a certain level of honor. There is no honor in stealing from others. No member of The Knights of Entropia (TKoE) shall engage in any pirating or player killing in lootable areas. This includes all Planets, Special areas and/or zones, including space. If you find yourself being attacked in these areas, or if a known pirates is advancing your direction, you are welcome to do whatever it takes to defend yourself. This includes killing the other player before they have a chance to kill you. Once you have killed the attacker you can also loot him/her. PVP in non-lootable areas is permitted, however it is generally frowned upon. If you are interested in joining The Knights of Entropia, we ask that you apply for membership in the society terminal, or have a Captain/Colonel send you an invite. One of our Colonels will contact you, instruct you to review our rules, and have you register on our website. Once this has been completed, your application will be accepted. It is mandatory for all TKoE members to have an account on our society website. When registering on our website, make sure you input your full in-game avatar name. Once you have been accepted into the society, you are expected to introduce yourself to the rest of our members. You can introduce yourself in the New Member? – Say Hello! forum. You may want to include who you are irl, what you do in-game, how long you’ve played EU, or what made you choose TKoE. The Rank of Colonel is reserved to 10 very special Knights. We have selected the number 10, with the General’s vote being 11, so that we will never tie in a vote. TKoE’s Colonels and General govern the society, and are expected to be active in-game and on the forum. Any Colonel inactive without reason for more than two months, will be demoted and replaced with someone better suited for the position. The recommendation system is a fair and involved way to achieve rank. Especially if recommendations are taken seriously, and individual members reach out to other members in the society. A person interested in a promotion should post a thread in the Promotion Requests forum. Make sure to follow our official promotion request template. Demotions/dismissals due to lack of attendance is performed on a monthly basis. All other demotions/dismissals are decided by Colonel majority vote, and are enforced only after the poll has finished. Once a member of TKoE reaches the rank of Private or higher, they are required to do monthly attendance in the society terminal. The attendance policy allows our Colonels to see who is active, and who needs to be demoted/dismissed. There is a limit on how many members we can have in our society, so we need to constantly make room for new active players. Click on the yellow “i” button. Failure to do attendance will result in your avatar being demoted or dismissed from the society. Keep in mind that we are a large, active society with a good deal of membership turnover. All society teams must include TKoE in the team name. All teams will use the Contribution: Share Loot distribution option, unless otherwise agreed upon by all members of the team. When team hunting with other society members, the default procedure is to equally split all items looted during the hunt, with all members of the team. Whether the item is looted during a global or not, it must be split evenly among the members who actively damage the mob. If the team hits a Hall of Fame or All Time High, all stackables, as well as items, must be collected and split evenly between all members of the team. The team leader is in charge of collecting and splitting the loot. If markup on the item is low, TT value will be split. The team leader is also in charge of selling any items, and splitting later. Any changes to the team loot split must be approved by all members of the team prior to the hunt. In the case that someone is not pulling their own weight in the team (wandering off/not shooting), the team is not required to split the loot with them. However, if a team member is actively participating in the hunt, doing their best to keep up, and just happens to miss out on the mob that HOFs or ATHs, it is expected this team member is included in the loot split anyway. Mining is allowed during hunting if you make the other players aware that you are doing so. If a player locates a claim, they may extract it during the Hunt, or come back to it later. If extracting the claim takes longer than expected, the other players can move on and the miner will have to catch up. If the team moves on during extraction, any items looted will not be split with the miner. Failure to obey these rules will result in disciplinary action or dismissal from TKoE. The forum ‘Public Information’ is closed to new topics and replies.